Entering into a veg box scheme can seem a little daunting at first and many people (myself included) have tried and failed in the past to be inspired to change the way we cook. I've certainly been in the situation many a time where the full to bursting beautiful vegetable box has turned into a wilting mess that made me feel terribly guilty before a significant proportion of it made it to the bin or compost. Thankfully things have changed in the way we shop, cook and eat as a family and here are my top tips to making the most of your veg box. 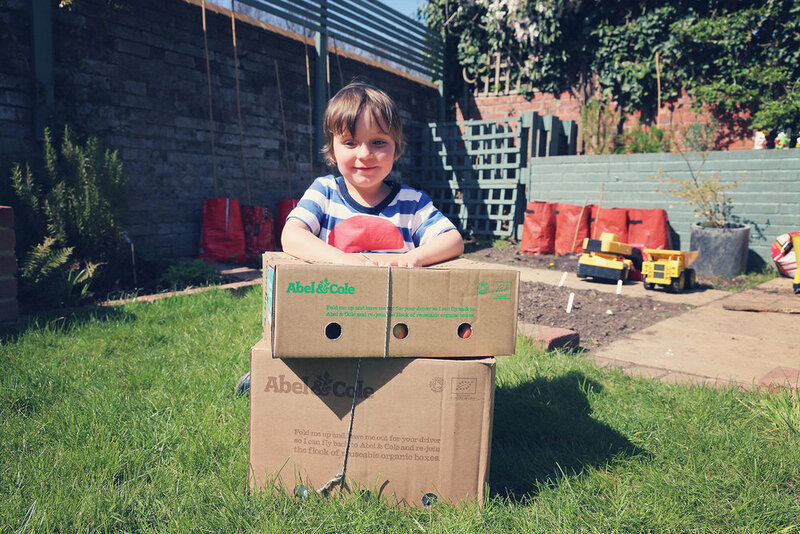 There are a multitude of companies offering fruit and veg box schemes these days from local greengrocers and farms to large national supermarkets. Before you commit to one have a good look at the things they offer for example the range of boxes, price, and flexibility in term of both order details and delivery. Many companies also give free groceries or gifts to new or returning customers so this is worth looking out for. After trying a few different schemes over the years we have settled very happily on a local company with whom we can find no faults at present. The produce is fresh, delivery is prompt and their customer service is really good. This is something that has taken me an awful long time to achieve on a regular basis. For a long time I found the idea of planning my meals a week in advance quite restrictive and favoured the 'make it up as you go along approach' of cooking. However a few things have changed over the years. Firstly as a family of five with children who thankfully eat well (and a lot) our weekly shopping bill was getting out of hand. I impulse bought a lot in the supermarket which ultimately led to more waste. I noticed I was regularly throwing away fruit and veg at the end of the week down to poor planning. I also realised that I was going to the shops each week buying enough food to feed us all for seven nights. When I started meal planning I also started looking at who needed feeding on each day. I quickly realised that with family visits and playdates, days out etc there were often several days of the week where some or all of us were being fed elsewhere and I could plan accordingly. On the flip side I could also plan for those nights that we were feeding a houseful of family or children's friends. People often wrongly assume that buying whatever you fancy from the shelves each week will lead to a more varied diet however I have found quite the opposite. We all tend to fall into a rut and buy the same things ever week and use them in the same way. Having a veg box challenges you to readdress that. I have gone into a little more detail here as to how I plan my weekly meals. If you've not used a veg box scheme before then its often worth starting out small with a veg box to supplement some of your weekly shop. Test the water and see how you get on. Its far better to use up everything in a small vegetable box than ambitiously order a large family box and leave a lot to waste. You can always increase the order the following week. Having a veg box delivered can be a really good way to get the family experimenting with some new foods but its also important to be realistic. If there is something you know nobody will eat opt out of that veg and the company will send you a replacement. Far better that than throwing it away week after week. Also use the opt out option if you have veg left over from the week before and you don't need any more this week. I sometimes find this is the case with certain root veg. You can also change the size of the box on a weekly basis. Personally I find that if I have a well stocked store cupboard I can make a good wholesome meal out of pretty much any vegetable. I always keep a good stock of various pastas, rices and grains as well as a wide range of herbs and spices (see my article on top ten spices here). Add to this a good collection of tinned goods i.e. chopped and plum tomatoes, coconut milk and several beans and lentils. Investing in bulk for your most used items can also save you money and trips to the shops. The beauty of a veg box is that you receive fresh produce that is in season. Ultimately this means you may get a glut of the same item for a few weeks and then none. As long as you are prepared for this it can be a good time to experiment with new recipes or ways of cooking. It helps to have a few recipes up your sleeve that can incorporate many of the same type of veg. For example coleslaw or root veg casserole are classics in our house when we get a glut of things such as celeriac and kohlrabi whilst stir fries and salads are really good ways to use leafy greens and salad veg. For a cook book addict like me meal planning is a great time to indulge my food obsessions but if you want quick recipes to hand then google is also your best friend. Many of the veg box schemes include sample recipes for the veg included that week and/or have a large recipe database on their websites. This would seem like common sense but its something that took me a while to learn. I used to choose meals at random and then despair when I went to cook something later in the week only to find the veg had spoiled. As a rule of thumb use salads and leafy greens within a few days, salad veg and things such as peppers and courgettes can last little longer and with the correct storage root veg can often easily last you into the next week. One of the major complaints about veg box schemes is that the fruit and veg don't last as long as supermarket bought produce. Take a moment to think about why that is and whether you want to be eating fruits and vegetables with added chemicals to extend shelf life. Learning how to store your produce can help make it last longer and good meal planning means you're using these items in the best possible way. There are lots of guidelines online with regards to storing your food correctly.